George Valentin (on a title card): I won’t talk. I won’t say a word! Some critics would be hard pressed to find genuine artistry in the film industry today, but they needn’t look any further than THE ARTIST, French director, Michel Hazanavicius’s homage to another era. It is a fine celebration of the cinema and the art involved in making the movies feel magical. True to the period in which it is set (Hollywood, 1927), the film is black and white, shot in the more box-y 1.33:1 aspect ratio and, perhaps most notably, the film is silent. Somehow though, without a single word uttered throughout, THE ARTIST keeps you hanging on every frame. 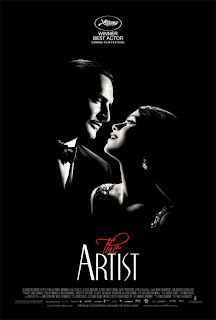 George Valentin (Jean Dujardin), the artist in THE ARTIST, believes the introduction of sound into film to be a gimmick, a passing fad. You and I both know how very wrong he was but he held true to the cinema’s authentic and humble origins. His refusal to grow and change with the times finds him falling out of favour with his studio and subsequently continuing to fall, only this time on hard times. Meanwhile, the woman he is in love with, actress Peppy Miller (Berenice Bejo, Hazanavicius’s wife) is being swept up in the emerging success of the “talkies”. Valentin must essentially adapt or die; he must find his voice again in order to finally be heard by his public and the woman he loves. As simple as the plot is, it is its refined execution that makes the whole exercise seem effortless, allowing nothing but great warmth and passion to emanate from the screen. It’s funny how we take things like dialogue for granted and it’s hard to believe that the movies really were like this at one point in time. As demonstrated in the film’s opening sequence, elegant theatres would be filled to capacity with patrons decked out in their finest wares, anxiously awaiting the latest screen adventures of their favorite Hollywood stars. An orchestra would not only fill the room with music but it would also fill the silence between the actors on the screen. Emotion and intention needed to be clearly communicated without speaking in order for the film to be successful. And while it may at times come off as exaggerated or false, the point was usually made. By honouring the silent film and doing it such great justice, THE ARTIST almost renders the usage of words completely pointless. How many sheep would you give The Artist? I almost went to see this today, but ended up watching The Double Life of Veronique for the tenth time. Is The Artist better than The Descendants? I’ll find out next week.